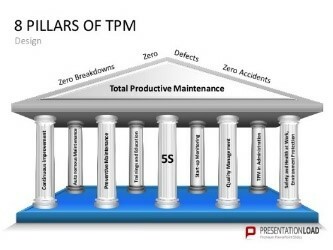 TPM, Total Productive Maintenance, is one of the bedrock principals of lean and it shares many similar thought processes and components. TPM is also arguably one of the most difficult lean tools to implement as it requires the greatest amount of culture change. However, this article isn’t directed at teaching the eight pillars of TPM. It was written to provide examples of how TPM can play a role in the office and home environment. Think about the problems and issues that arise if your printer stops working, the Internet goes out or if an unbacked up hard drive dies. I like to look at the IT staff as the office’s maintenance staff. They ensure that data backups are made, equipment is serviced and that your office environment runs smoothly. But it is not the IT department’s full responsibility to ensure that your computer works and that you save your data correctly. There is responsibility on the user too and that is what TPM is about. TPM’s goal is to engage all groups that use, manage and maintain the equipment, building space or even data. Building maintenance is important just like the IT infrastructure. We all want to come to a clean work or home environment where the equipment we need works correctly. Some companies and many homes don’t have a cleaning service and these tasks are assigned to all employees or family members. Lean icon Paul Akers, owner of FastCap, has famously stated that lean starts in the restrooms. Having employees or family members take ownership of where they work or live is very important and is just like having operators taking ownership of their equipment. Using TPM boards are a great way of managing these tasks and is something you can use not only at work but also at home. You can use TPM boards to help manage household chores with your children and even to ensure that your pets are fed. How we organize and store data is important, especially when this data is shared or posted. Having a standard template on footers can be extremely helpful with document control. These footers allow for easy identification of whose work it is and when it was printed and if any pages are missing. Storing hard copies of important files are sometimes required for your business or even for you personally. This document retention can be an increasing burden as boxes of files are collected and stored. This makes finding the documents or disposing of them in a timely manner a problem and a management nightmare. Creating a self-managing document system provides easy access to the documents you may need and forces the disposal of the files based on the retention limit. You could think about doing this for your tax records, too. Having multiple project files can become a big problem. My work experience has shown this when I was reviewing work from one of my employees and the changes and errors that were fixed in the past kept reappearing in the documents. Such problems are due to lack of controls, which causes many companies to adopt a document control software and tools such as cloud document storage and change trackers. These tools make sure the current version of the file is being worked on. If you don’t invest in this type of software system, a document naming policy or practice may help to ensure that you select the correct version of the file. Maintaining your data in an easy to find storage method and system is important but scheduling a back-up of your computer is critical. Maintaining data is just as important as keeping your car or other equipment running. Ensuring your files are backed up in a remote location and done several times is important to avoid a potential catastrophe. I know from experience, being able to recover an old version of a document or having documents and files backed up when your home laptop dies, is a life saver. I hope you can see that TPM tools and methods can be used in a wide variety of areas. Having everyone engaged and working together as a team to eliminate all waste through the eight pillars of TPM is extremely powerful. 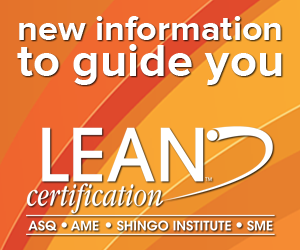 Remember lean and TPM are about making your life safer, more efficient and easier. The next time a device reminds you of maintenances such as a thermostat reminding you to replace the air filter, car alert for low tire pressure (or is time to change the oil) or even when your printer alerts you of lower toner, you can thank lean and TPM principles for trying to make preventive maintenance simple and easy in your everyday life. Obtain certification at the rank that is most appropriate to your career, knowledge, and experience.